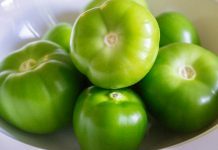 It’s barbecue season again, and what is a better side dish for your steaks and burgers than some fresh garden tomatoes? 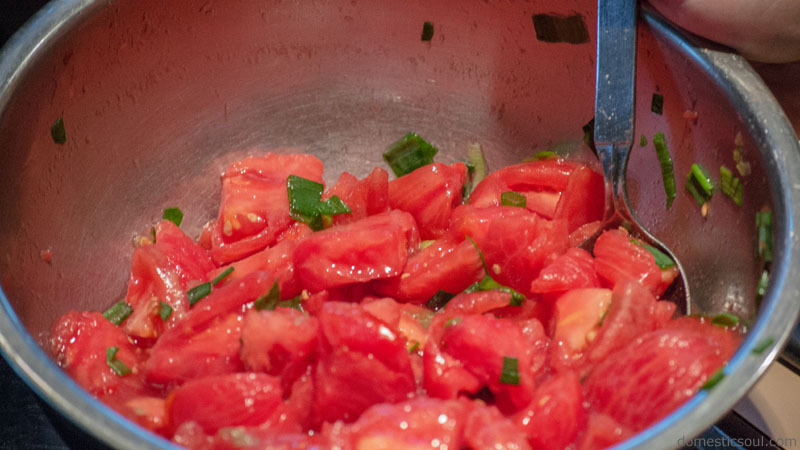 This tomato salad recipe has been a staple at our family barbecues for as long as I can remember. 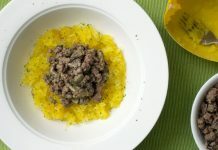 Mama Soul‘s garden usually produces an incredible amount of tomatoes – so much so that even after giving some away, we still needed to come up with creative ways to use up the rest. Growing up in Mama Soul‘s house, BLT sandwiches were very common. So were plain tomato sandwiches. 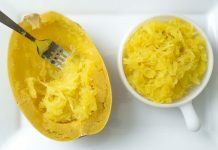 Sometimes we just ate them as if they were apples – bite right into them and let the juice drip down your face. No sense letting a juicy, garden fresh tomato go to waste! That said, Mama Soul has reminded me to tell you all that this recipe is best when made with fresh garden tomatoes and not store-bought hot house tomatoes. 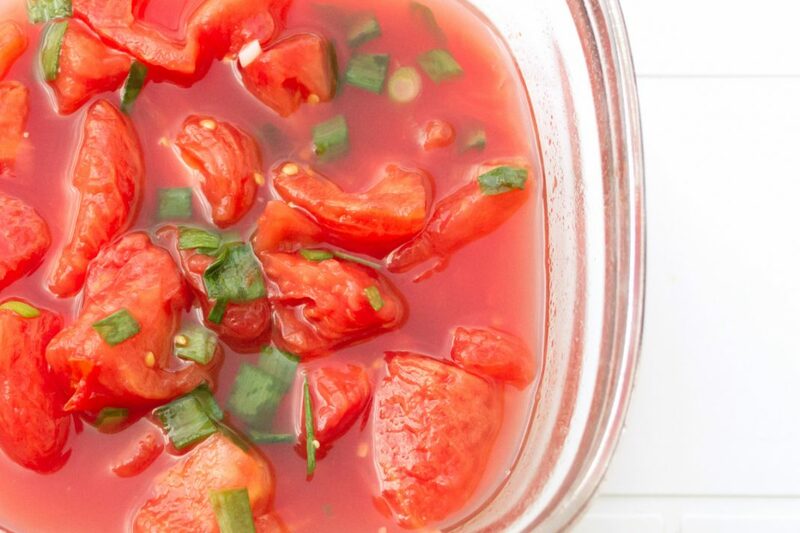 So if your tomatoes aren’t bursting from your garden yet (or your farmer’s garden), hold on to this tomato salad recipe until they are. It’s totally worth it. If the only tomatoes you can get your hands on right now are less than stellar, try roasting them instead. 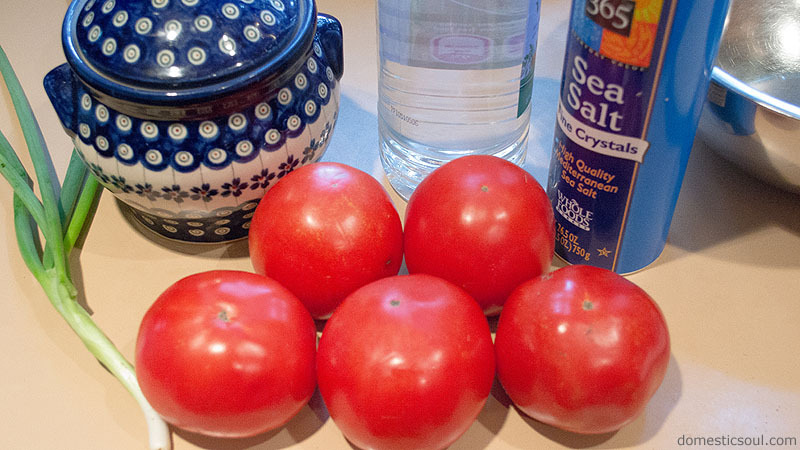 Roasting is a great way to add flavor to tomatoes that are a little lower quality. They’re also a delicious topper for a juicy burger. Yum! 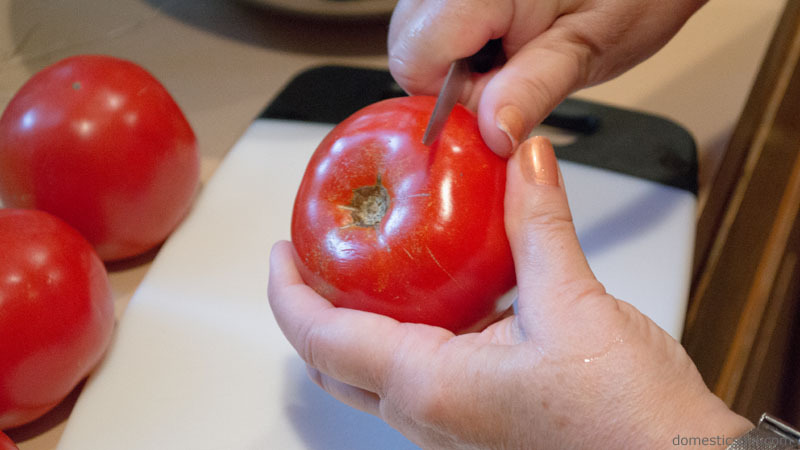 First, using a small knife, scrape the side of the edge all the way around the tomato. 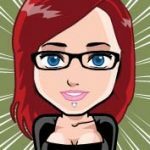 Use a bit of pressure for this. 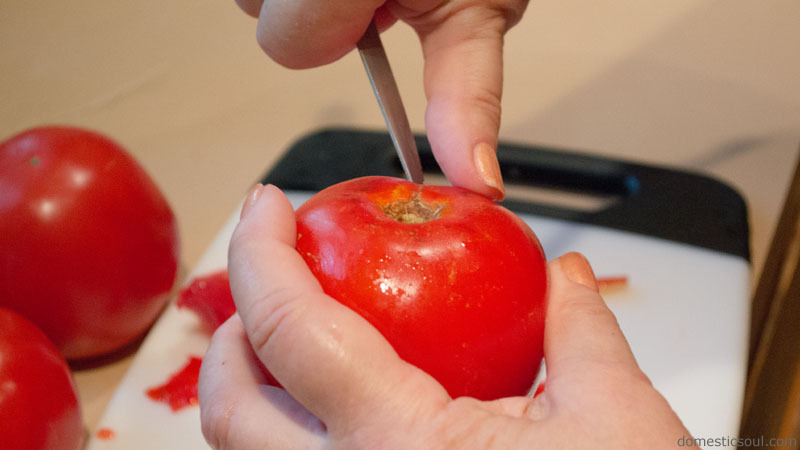 You’re trying to loosen the outer skin from the rest of the tomato, but you’re not trying to peel it yet, so you don’t want to puncture the skin. 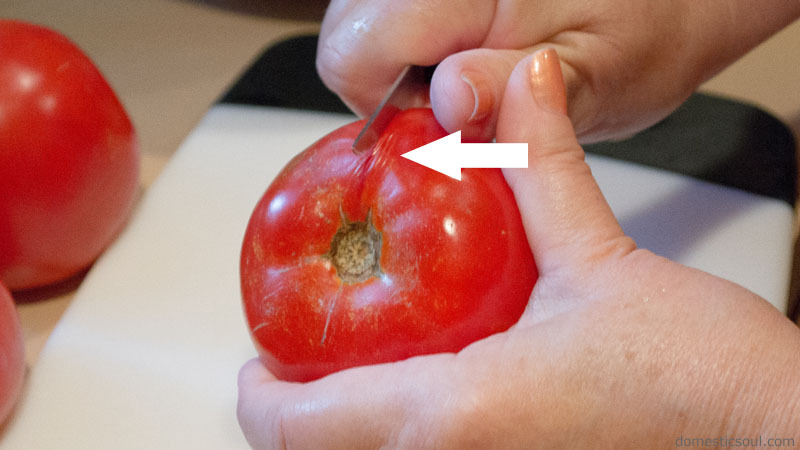 Keep scraping along the skin of the tomato until you see wrinkles start to form. Now the skin is ready to be punctured. Use the point of the knife and cut into the skin. And now you’re ready to peel! Do this for all 5 tomatoes. Step 2: Chop tomatoes into large chunks. Step 3: Chop scallion into small pieces. 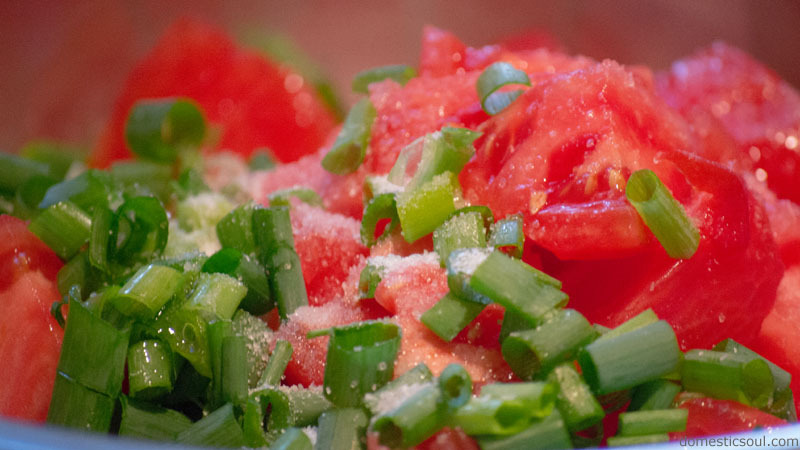 Step 4: Add tomatoes and scallions to a bowl and top with salt, sugar, and white vinegar. Step 5: Mix and let sit for at least an hour. Step 6: After an hour, it should be ready to serve. After an hour has passed, the tomatoes should have released their juice, which mixes all the flavors together and creates a nice dressing. At this point, it’s ready to serve. You can let it sit for more than an hour, an hour is just the minimum. 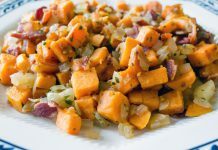 Sometimes we make this recipe the day before the barbecue and let it sit in the refrigerator overnight. You won’t lose any of the flavor that way. It will be just as good. 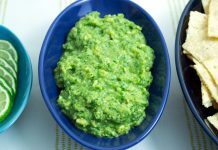 Give it a try at your next cookout. 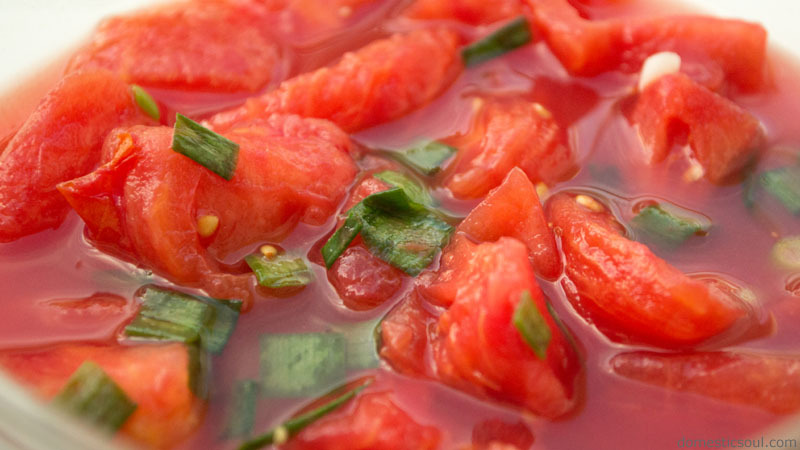 And don’t forget to try this homemade bbq sauce for all the meat you’re serving with this tomato salad! 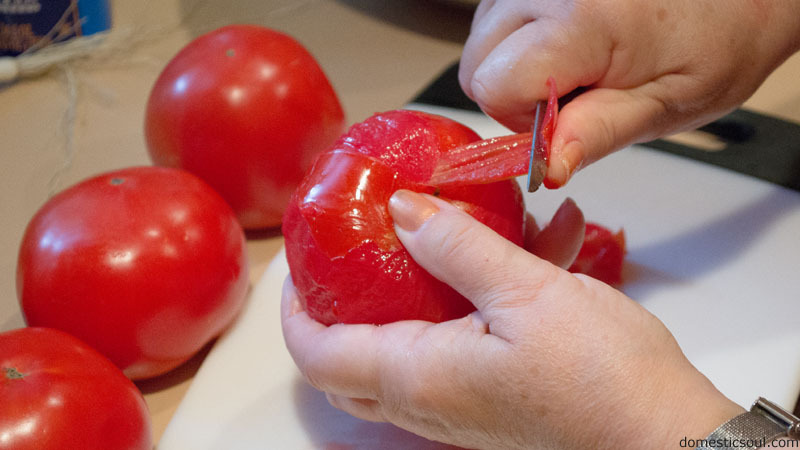 Peel the outer skin from the tomatoes. 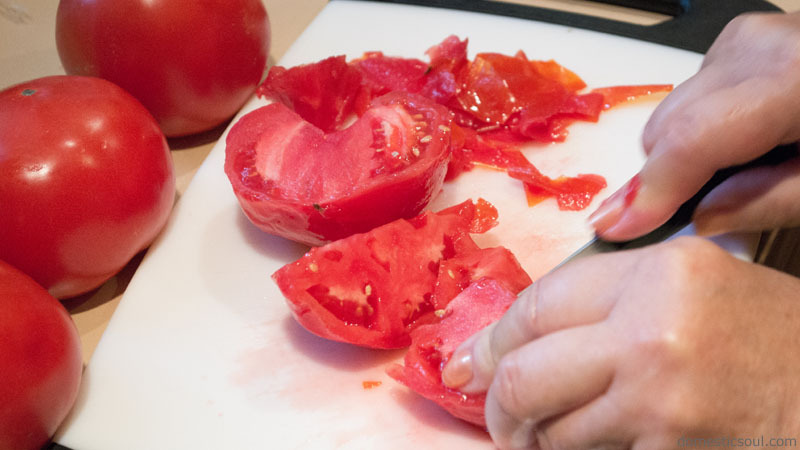 Chop tomatoes into large chunks. 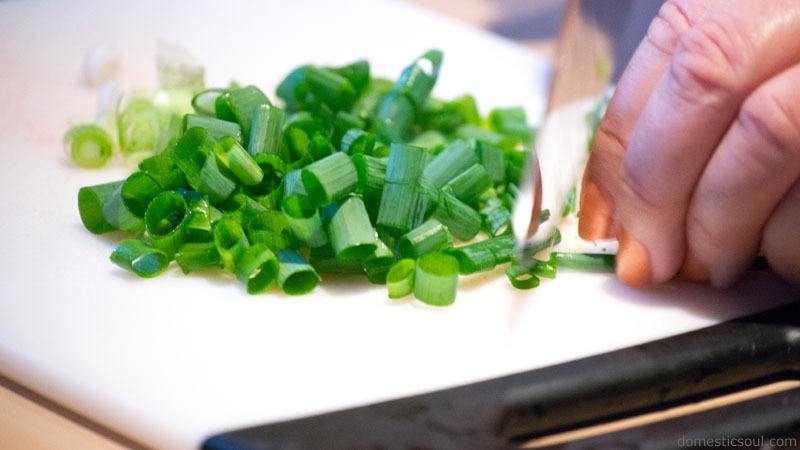 Chop scallion into small pieces. 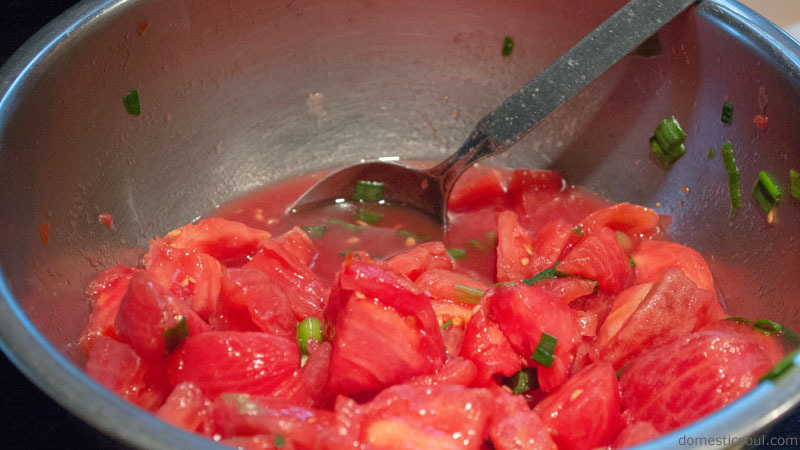 Add tomatoes and scallions to a bowl and top with salt, sugar, and white vinegar. Mix and let sit for at least an hour. After an hour, serve and enjoy!